Whoever christened Southern food as soul food was one smart biscuit, er, cookie. Nothing speaks to my soul quite like some good ol' Southern comfort food in the form of buttery biscuits, fried green tomatoes, and fried chicken. Since returning home from Charleston, I can't quite get the southern out of my own soul, so when I was asked to participate in Healthy Solutions Spice Blends Recipe Challenge using their Ultimate Burger seasoning mix, well, you can guess where my inspiration came from. Picture this along with me. 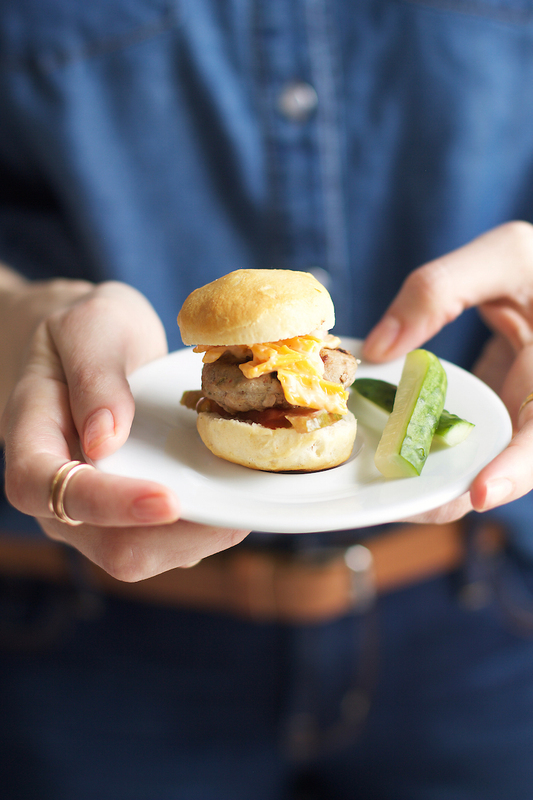 A fluffy, buttery biscuit topped with zesty quick-pickled green tomatoes and a well-seasoned turkey burger piled high with creamy pimento cheese. Hold that basket of biscuits right there. Saaaaay what??! Oh. And did I mention that they are mini size?? As in, you can keep popping these babies in your mouth and not feel guilty at all. I mean, you're feeding your soul, so that in itself should makes these guilt-free, right?! 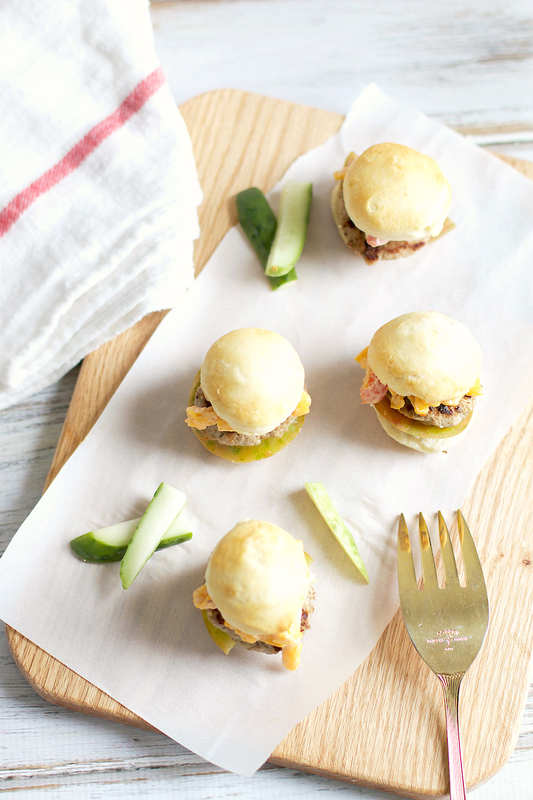 Besides being little bubbles of southern comfort, these sliders are super easy to throw together, with lots of different options, making them suitable for a variety of gatherings (everything form weeknight dinners to weekend parties) as well as various cooking skill levels. If you're making everything from scratch (which you should because it's like super easy and way better, duh! 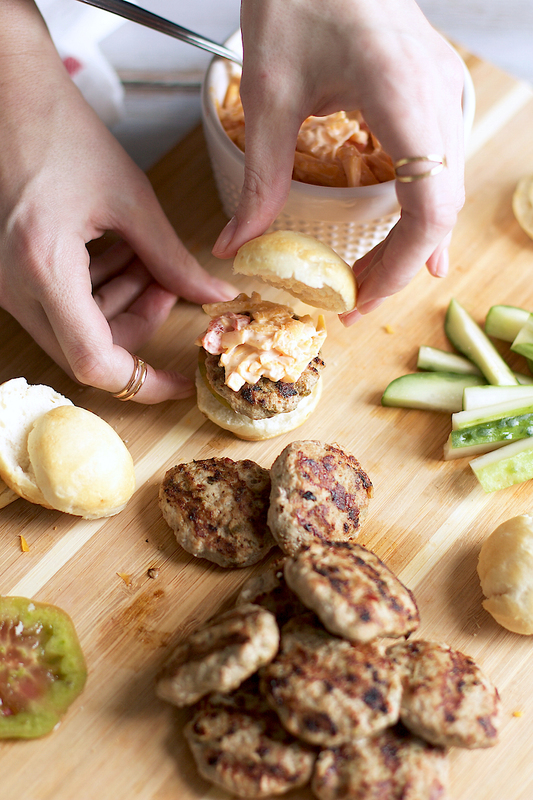 ), your plan should be to make the tomatoes first, then whip up your pimento cheese spread, finally bake your biscuits, and, last but not least, throw together the turkey patties. And then, as they say in the South, DIG IN Y'ALL! In a medium-sized bowl, combine the ground turkey and spice mix. Mix, with your hands, until the spices are well-incorporated into the meat. Heat a grill pan or skillet over medium heat. While the pan is warming, form the burger patties, using a tablespoon of meat per burger. Grill the patties 1 1/2-2 minutes per side, 3-4 minutes total. To assemble the burgers, place a tomato half on the bottom of the biscuit bun. Add your burger patty and a tablespoon of pimento cheese. Top with the other half of the biscuit and serve immediately. If you have any leftovers, store each component separately (i.e. 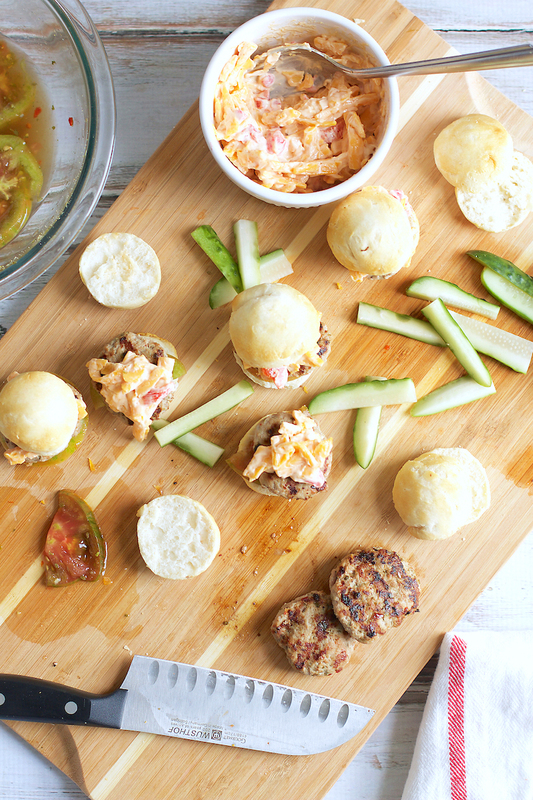 pimento cheese in one container, tomatoes in another, burger patties wrapped in plastic wrap, etc). Feel free to use other types of ground meat in place of the turkey. 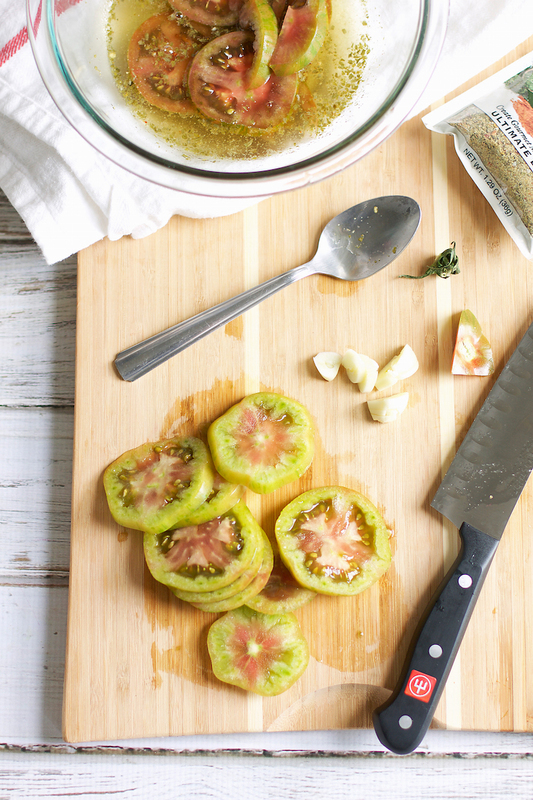 While my quick-pickled tomatoes are just that (quick), if you find yourself short on time, you have several options- use a green tomato sliced and sprinkled with some salt and pepper, check both the pickle section and olive/salad bar section of your local grocery store for green tomatoes that are already pickled (ours carries them in their olive bar section), use regular pickles, or use a regular red tomato. As with the tomatoes, the pimento cheese is very easy to throw together (especially if you use pre-grated cheese), but if you don't have time, feel free to use store-bought pimento cheese. I am personally not a fan, but it is a quick alternative. 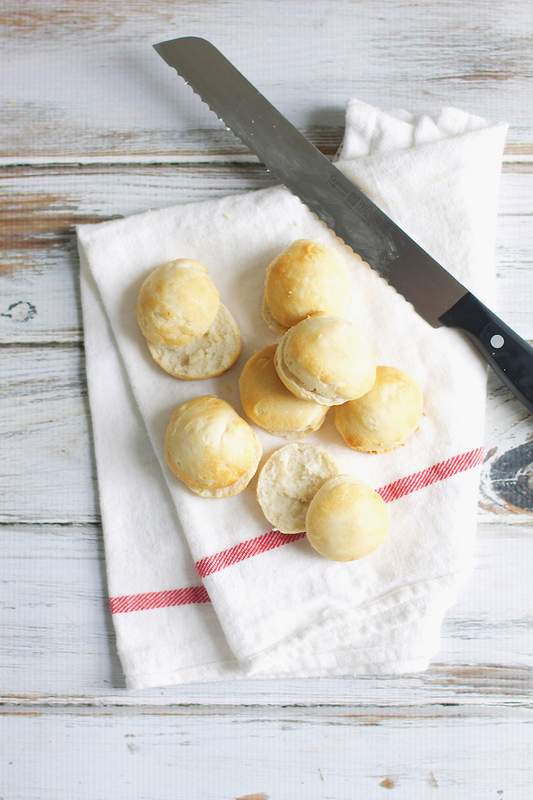 For the biscuits, you can make them from scratch, or by the bake and serve ones from the store. To make the mini sized buns, I used a shot glass as a cookie cutter. Just make sure you flour the rim of the glass to prevent it from sticking to the dough. Use your hand to spread the dough out slightly so that you can get two mini rounds from each biscuit (and then bake up those scraps as monkey bread or as a base for some strawberry shortcake! ).